Jay O'Brien puts on a Flyers jersey after being selected with the 19th overall pick. 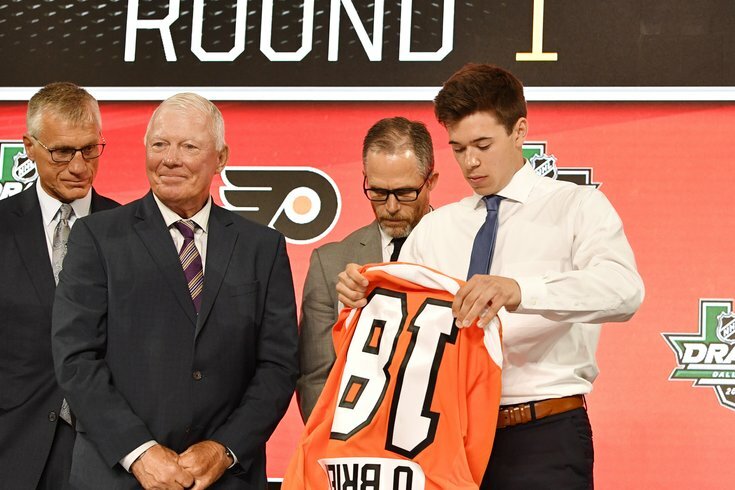 After nabbing winger Joel Farabee with the 14th overall pick in the 2018 NHL Draft — the pick acquired when they traded Brayden Schenn to St. Louis, the Flyers used their own pick on center Jay O'Brien. The center, who is committed to attend Providence in the fall, went to the same school as another Flyers great scorer Jeremy Roenick in high school. He was the USA Today player of the year in 2018 and ranked as one of the top centers in the class. His mom was pretty excited when his name was called by Ron Hextall. He is a high energy guy with a high ceiling and a potential high volume goal scorer for the Flyers at the NHL level. Will he be able to make a quick leap to the highest level of hockey? "It's tough to put a number on it," he said on NBCSN after being picked, "but I am just going to go to Providence to try and help them win another national championship." When it comes to the All-American Prospects Game in Buffalo, the vast majority of invitees come from either the USHL or the United States program in Michigan. To get an invite as a high school prep star says something significant about that player and what potential he has. Thayer Academy’s Jay O’Brien certainly fits the mold of good potential at the next level. Widely considered the best high school player in this draft, O’Brien got an invite to Buffalo and was only one of two New England prep players to get the honor. To go from playing on the prep ice to the ice at Key Bank Center is a dramatic change and one very welcomed by O’Brien. It showed the hard work he put in was paying off. Jay O’Brien is a prospect that has not gotten a lot of exposure. He spent the majority of this season playing high school hockey at Thayer Academy in the USHS-prep school system. The numbers are eye-popping as he scored 43 goals and 37 assists for 80 points in just 30 games. O’Brien also eight games for the Cape Cod Whalers U18 team, scoring six goals and two assists. Now we are not going to pretend that we have access to those games, and so we haven’t seen O’Brien put up the big numbers. But with the buzz that he has created in scouting circles, we were intrigued and checked out some of his more high profile games.